As a special option, AlumiSonic guitars are also available with Graphtech Guitar Labs “Ghost” ® Pickup Systems for an incredibly authentic, studio quality acoustic guitar tone at the flick of a switch, as well as the option of a 13 pin MIDI compatible output. The 1/4” jack stereo output allows for a simultaneous use of both guitar pickup and acoustic guitar sounds as two separate signals with a stereo cable, or both signals can be combined as one balanced mono output when an ordinary cable is used. The separate 13 Pin MIDI output option can be used with any of today’s state-of-the-art MIDI converters and will provide the fastest and most accurate tracking available on the market. The Ghost system is available in the form of two separate processors being the Acousti-Phonic processor and the Hexpander MIDI interface processor (or both combined together), that receive an acoustic signal from 6 independent resin saddle pickups. The Acousti-Phonic processor has a preamp that adds realistic, EQ’d acoustic guitar sound to your guitar without altering your magnetic pickups. You can use magnetic pickup and acoustic sounds one at a time, simultaneously as a stereo output, or blended together for an enhanced electric effect. Controls include a single onboard 3 way micro “Quick Switch” for accessing Acoustic/Both/Magnetic signals, an onboard 2 way Mid/Dark Micro Switch (or Push/Pull potentiometer switch) for a brighter midrange to darker acoustic EQ’d sound, and a volume control potentiometer. The volume control can be provided as an independent knob or in concentric combination (stacked) with any other Potentiometer control on your instrument, based on your custom configuration. All Acousti-Phonic equipped instruments include an onboard 9v battery compartment (a requirement for the Acousti-Phonic Preamp only), accessible from the back of your guitar. AlumiSonic offers either hinged battery boxes (black plastic), or screw mounted metal plated battery access panels. 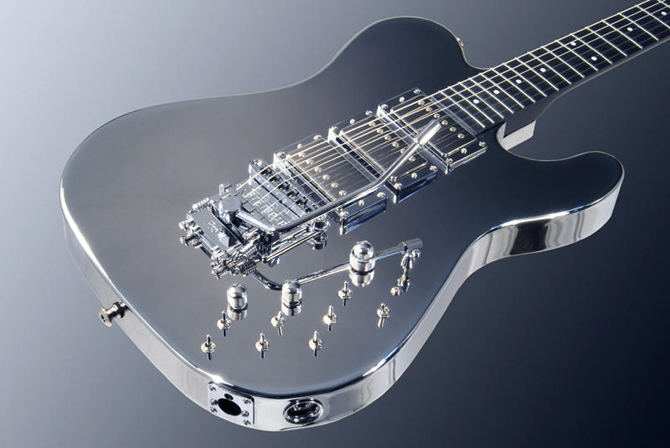 All AlumiSonic 1100 series guitars are equipped with metal access panels only. The Hexpander MIDI Interface processor adds MIDI capability to your guitar via 13 Pin output. Plug your guitar into pitch-to-MIDI converters by Roland and Axon and receive the most responsive and accurate triggering on the market today. The Hexpander MIDI Interface operates with the Roland GR55, VG99, StringPort, as well as legacy units like Roland GR33, GI-20, and V Bass, Axon AX-50, AX-100, Yamaha G50, and many more. With the Hexpander, you can use all other “guitar” sounds including magnetic pickup and Acousti-Phonic processor sounds, one at a time, or simultaneously. Controls include a single onboard 3 way micro “Quick Switch” for accessing MIDI/Both/Guitar signals (including Piezo when the Acoustiphonic is used, a Program Up/Down Micro Switch remotely operated from your guitar, and a volume control potentiometer. The volume control can be provided as an independent knob or in concentric combination (stacked) with any other potentiometer control on your instrument, based on your custom configuration. “Ghost” ® Pickup System components installed on AlumiSonic guitars are priced as upgrades to custom orders. Costs include parts and installation on AlumiSonic guitars only. The AlumiSonic Stacked Bell Knob is custom made exclusively by AlumiSonic as a concentric control option for our 1100 Series instruments. The Stacked Bell Knob is primarily used for applications where other control positions are occupied with Piezo or MIDI Volume controls. Typically stacked concentric knobs are used for either a combination of stacked Magnetic pickup Tone control combined with pickup Volume control, or for a combination of stacked MIDI and Piezo Volume controls in one knob. As a very special custom option for our T-6 style bodies, the Back Removable Pickup Chamber system allows for each pickup to be independently set in 3 surrounding acoustic modes. Either Closed with an encapsulating Tone-Wood Chamber in place, Open with the back of each pickup completely exposed, or Hollow Body mode with an aluminum panel fastened to the back of the body and no chamber in place. Previously, AlumiSonic had made non removable wood chambering available for players who either used excessive overdrive and needed to suppress feedback, or prefer the sound of a hybrid blend of Aluminum resonance through the tone-wood of their choice. 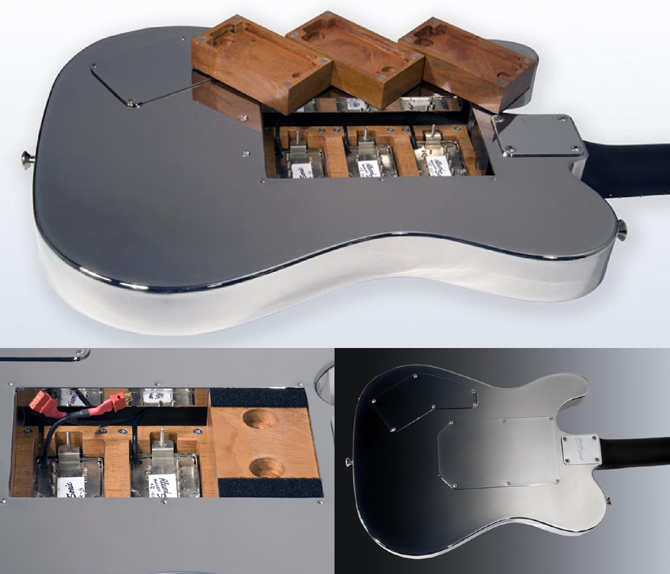 With a removable system, your guitar can be converted from chambered to hollow, as easily as removing the back panel of the instrument and removing each magnetically attached chamber simply by pulling them of in any desired combination per pickup. Chambers available range in tone with Mahogany being the warmest and Ash being the brightest. Weights listed include the total weight of all chambers combined and would be added to the starting weight noted on the specifications page for your guitar. Chambers for guitars with 2 pickups will extend the full distance of the body between the pickups, so the chamber area covered for 2 and 3 pickup guitars is the same. Prices shown are based on custom fitted Back Removable Chambers for either two, or three pickups (as a custom pickup order) and metal cover plate. Custom pickup chambering as a non-removable option is available for players who either tend to use excessive overdrive, or prefer the sound of a hybrid blend of Aluminum resonance through the tone-wood of their choice. When using just the right amount of overdrive with a hollow (un-chambered) configuration, infinite sustain through sympathetic feedback can be more easily obtained. 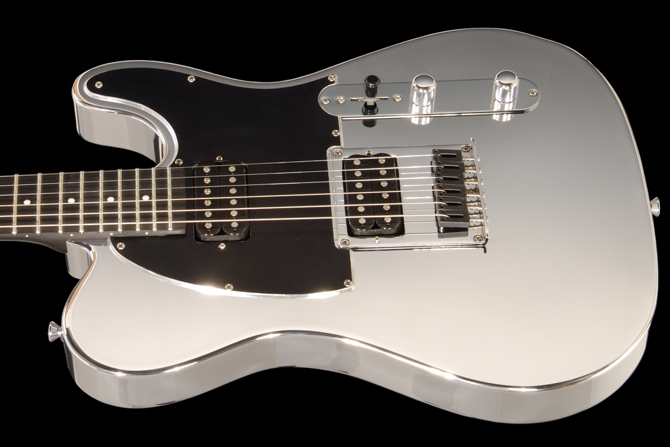 The body resonance that enhances this sustain projects sound to all sides of the pickups and also back into the strings. Under overdrive settings at extremely loud volumes, this resonance can become difficult to control. Pickup chambering surrounds the pickups and slightly dampens the top and bottom body panels. These chambers will reduce resonant hollow body feedback up to 25%. The preferred chambering position is the hotter bridge position for blues and rock, or both positions for classic rock. 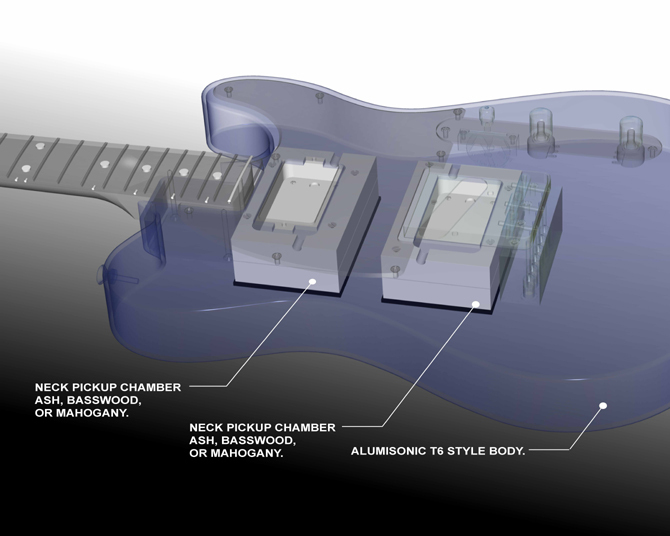 With a chambered bridge only, the neck pickup can be used for maximum aluminum resonance playing or both positions can be used for a combination effect. Chambering a pickup does not change the sound of the instrument to that material type. With a chamber installed the superior aluminum body sound is still the dominant sound, while the chamber material accents that sound accordingly. Available in Chrome or Gold, the Stetsbar Tremolo system was designed as a removable Tremolo that mounts directly to the Surface of any flat top instrument with no invasive routing required. We found this ingenious design created by Eric Stets here in NY, especially useful as a Tremolo alternative that would not impede on the hollow area of our T-6 bodies and dramatically change their tonal qualities. Unlike other surface mounted Tremolo’s, the Stetsbar carries the bridge saddles with the movement of the tremolo and therefore stays in tune perfectly. AlumiSonic will install the bridge as removable system with a shimmed neck, or as a permanent system with the required neck angle built into the neck pocket. The Stetsbar is also available with Graphtech Piezo saddles for use with the GraphTech “Ghost” Acousti-Phonic Piezo system and GraphTech Hexpander MIDI interface. Contact AlumiSonic for pricing. 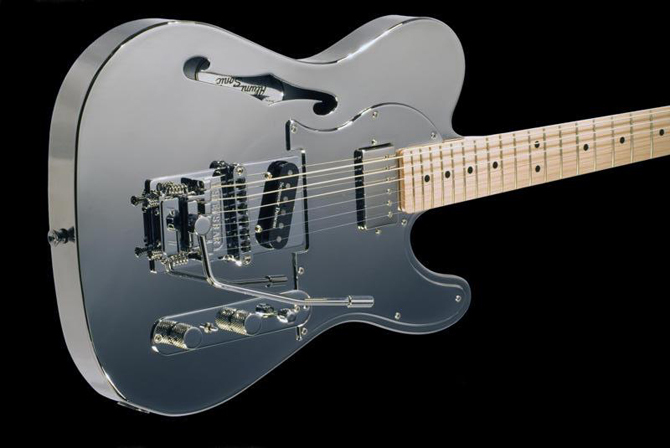 A bridge position Humbucker and modern T style Bridge plate is an available an upgrade for any Master Alloy, Evo-Master, or Classic Alloy guitar. 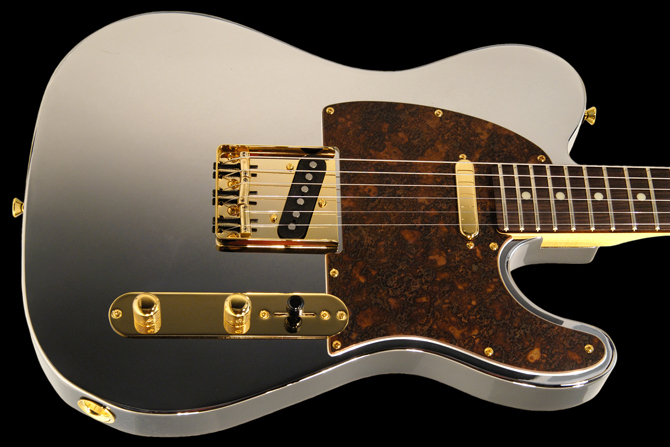 The humbucker bridge plate is available in Chrome, Gold, or Custom Copper Plating. Each bridge can be fitted with matching metallic saddles, Graf-Tech String Saver Teflon Saddles or Graphtech Piezo Saddles for use with the optional GraphTech Ghost Pickup system (contact for price). Humbuckers available include AlumiSonic Alnico-V Overwound or Seymour Duncan APH-1 Pickups. Contact AlumiSonic for other possibilities that we may have to offer. Humbucker’s available in stock, pickups suited for your custom guitar and playing styles as well as Humbucker prices, may vary. With overwound pickups, or simply with overdrive playing in mind, we would like to recommend using Custom Tonewood Pickup Chambering in any Humbucker position. Please also review our Pickup Chambering options. 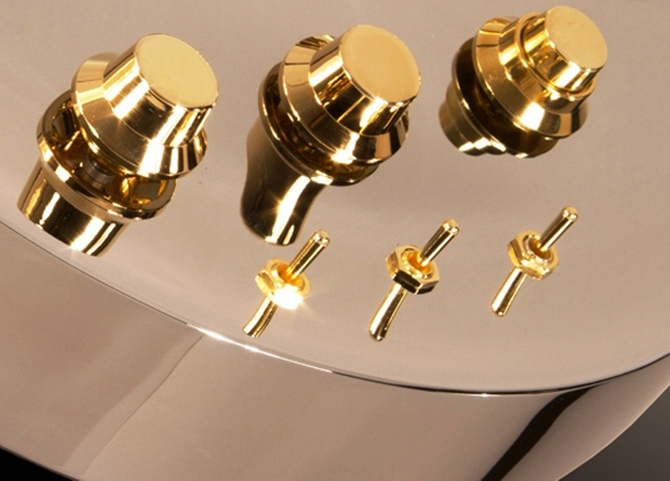 Available as an upgrade for any Chrome plated Instrument, as a custom upgrade of only $95.00 we will provide your instrument with gold plated hardware including screws, plates, bridge, knobs, ferrules, strap buttons, tuners and all switches. Contact AlumiSonic for availability prior to ordering.